The mountains, the glens, the lochs, the tartans – and of course the whisky: many are the wonders to be enjoyed north of the border. And to that list should surely be added, the wildlife. Scotland’s relatively sparse human population and untamed countryside have made the country a haven for the UK’s wild creatures, and a nursery for animals whose British numbers are just starting to recover, such as the pine marten, the osprey and the beaver. But the nation’s deer need no encouragement. There are estimated to be 1½ million deer living wild in the mainland United Kingdom. And Scotland is home to more than half of them. 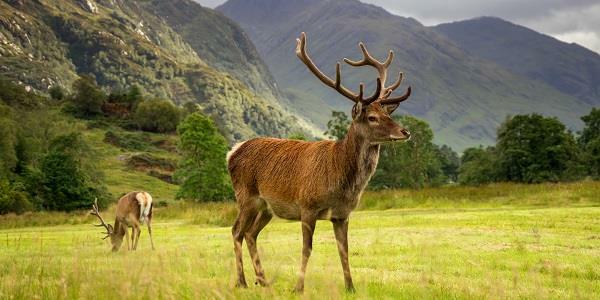 The deer range the length and breadth of the land – but at any one time, a goodly proportion can be found in the vicinity of Tigh Mor Trossachs: in the Loch Lomond & The Trossachs National Park, which surrounds the holiday site. Deer are instinctively timorous beasties – but sheer force of numbers surely means that with a modicum of patience and commonsense, you’ll be able to observe these beautiful, graceful creatures in a natural setting. But how do you know what you’re looking at? 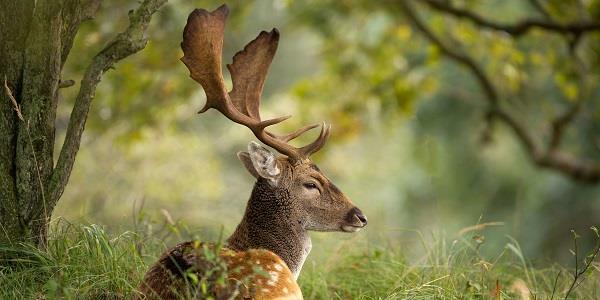 There are four species of wild deer living in Scotland: roe deer, red deer, sika and fallow deer. Roes and reds are native species; they colonised Scotland naturally after the end of the last glaciation around 10,000 years ago (and arguably the red-deer population, or its ancestry, goes back a lot further, to when Britain was part of the European land mass). Simply by virtue of its size, the red deer is easy to distinguish. The red deer is the largest land-mammal in the UK with a male (stag) standing 3½ to four feet at the shoulder, and weighing 200 to 400 pounds. Adult females (hinds) are smaller. The red deer’s summer coat is reddish brown to brown and the winter coat is brown to grey. At 360,000 to 400,000-head, red deer are the most numerous – and the most impressive of the four species. Indeed, the red deer stag has become nothing less than an icon: the Monarch of the Glen. To come face-to-face with such a noble beast anywhere is a privilege; to meet one in Scotland, where it truly belongs, is awe-inspiring. Numbering some 200,000 to 350,000, adult roe deer grow to two to 2½ feet at the shoulder and weigh between 22 and 55 pounds. Males (bucks) are slightly bigger than females (does). They are small and nimble, with a summer coat of russety brown turning to grey, pale brown or (occasionally) black in winter. They have black noses, white chins and white rump patches. Their short antlers have a rough or ridged surface. 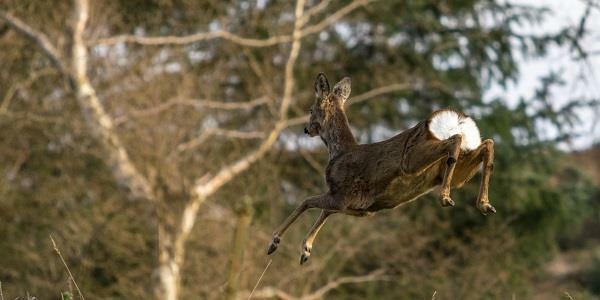 Roe deer adopt a bounding run when spooked (see above). Just 2,000-odd in number, adult male (buck) fallow deer are normally between 2¾ and three feet at the shoulder and weigh 100 to 200 pounds. Females (does) are 2½ to three feet at the shoulder and weigh 80 to 100 pounds. There are four varieties, but the common variety has familiar tan/fawn colouring with white spotting (becoming long and grey with indistinct spots in winter) on the flanks and a white rump patch outlined with a characteristic black horseshoe. The fallow is the only British deer (a late, naturalised arrival, in the 11th Century) with ‘palmate’ antlers – the tines partly conjoined to form a broad, flat surface (see below). Introduced into Britain from the Far East in 1860 and now numbering some 25,000, sika deer (below) are similar in size and coat to fallow deer, but darker. They are reddish-brown to yellow-brown in colour with a dark dorsal stripe surrounded by white spots in the summer. During winter, they are dark grey to black and the spots are faint or absent. They have a very distinct white gland on the lower back leg. Their tail is shorter and with a less distinct stripe than fallow deer. First, while these are four distinct species, two – the reds and the sikas – have the potential to interbreed. Red deer could gradually change in appearance, genetic make-up and behaviour as hybrids become more common. This is something the Scottish government is rightly keen to guard against. Second, the fact that you are able relatively easily to find deer (of any stripe) to observe is because they have become too numerous. Since the last of Britain’s wolves died out in the late 17th Century, deer in the UK have had no natural predators – and they are a pest. 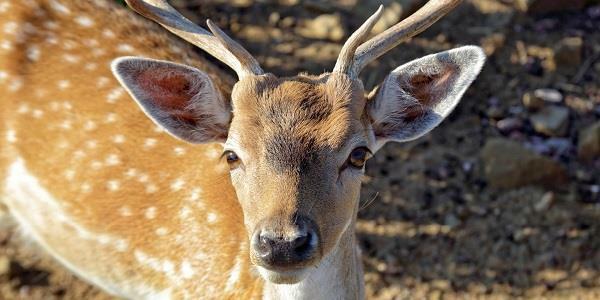 Cute/majestic they may be, but deer numbers have to be controlled, one way or another (whatever your views on blood sports) – for the good of the farmers, and the animals’ own long-term wellbeing. But as humans we’re nothing if not experts at cognitive dissonance. So, while remaining clear-eyed as to their future, let’s celebrate these magnificent creatures for what they are.